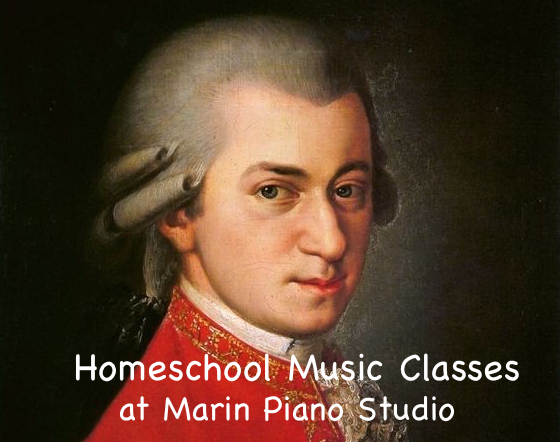 I am thrilled that you are joining our family, here at Marin Piano Studio! I aim to create engaging, high quality music instruction and piano lessons that ignite a student's imagination, creative energy and drive to learn. I am committed to guiding all my students to become exceptional music lovers, musicians, or both. I strive for this through teaching solid musical foundations, by using interactive and engaging teaching tools and methods, and by bringing my passion for music and positive personal growth into each student's classes and lessons. I sincerely appreciate you taking the time to find out about my homeschool music appreciation program, and welcome you and your family as you join me for a wonderful musical journey - a journey that is just beginning. There is lots of fun and music up ahead!